« Christmas in New Harmony! 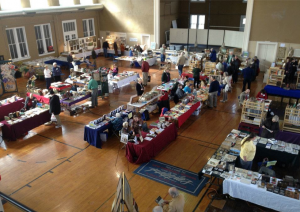 The authors at JPeg Ranch, Jim and Peg Redwine, will once again be displaying/selling their books at The Fifth Annual Antiquarian Book and Paper Show, which will take place on February 4th and 5th of 2017, in the historic Ribeyre Gymnasium on New Harmony’s Main Street. Brave the weather – come on out and see us!